I was wondering, after watching a Big Rig Steve video a few days ago, does LADOTD have any near-term plans to rebuild I-20 through Shreveport? My money is on the "no" vote. I haven't heard of anything near- or long-term concerning I-20. The only thing that comes close to "near-term" involves the I-49 ICC, I-49/I-220 (in progress), and the possible twinning of the Jimmie Davis bridge over the Red River. Question: Has Clearview been abandoned or not? I've seen signs going up in New Orleans that are FHWA recently, but then I've seen Clearview going up elsewhere. The interim approval from the FHWA has been revoked, so unless those signs were approved and laid out before then, there shouldn't be any new Clearview signs being put up. 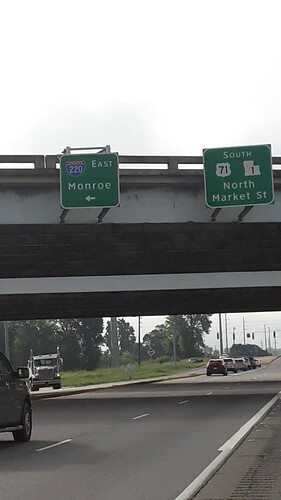 A new sign at the Grambling exit on I-20 (a panel sign from the 90s destroyed by an 18-wheeler replaced by an extruded sheet sign) is in FHWA font. New signage from a repave project between the Ada/Taylor exit & exit 47 were also done FHWA style. 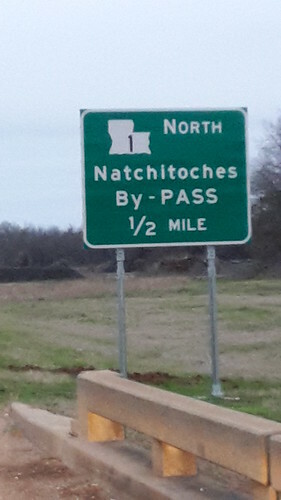 Louisiana must've gotten on the ball and made up a bunch of new Clearview signs, but never got around to putting them up. Literally 30 days before the FHWA revocation of Clearview, new Clearview signs went up all around the New Orleans area. Another thing I've noticed this year, particularly in the New Orleans area. I can think of at least 3 places where overhead pantries and pull through signs have come down (or were never finished being installed) and been replaced with the GDOT style side post mounted guide sign. The difference however, is that the LaDOTD signage is scaled down significantly compared the original signage and is hard to read until you're up close. These have replaced pull throughs at the split from the 310 northbound to the I-10, and on the I-10 eastbound approaching Loyola Dr. There are some in each direction of the Twin Span as well where the trusses were never installed into the supports to complete the gantries. I recall seeing this in Baton Rouge as well, but I don't remember where. Pretty easy answer to that question: LaDOTD is doing some things on the cheap, like that US-11 exit sign. That's just a face-palm of a sign. They might as well have just used a US-11 shield, an arrow and nothing when using a sign panel that small. Meanwhile here in Oklahoma both OTA and ODOT have ditched Clearview, but they're still goofing up sign layouts, not following MUTCD specs correctly, much less even matching up sign legends with green panel sizes and shapes to hold the message properly. That helps prove a point I've made previously that the type family utilized on a sign layout has very little to do with someone composing a traffic sign design correctly. Now we have a growing collection of face-palm layouts set in both Series Gothic and Clearview. 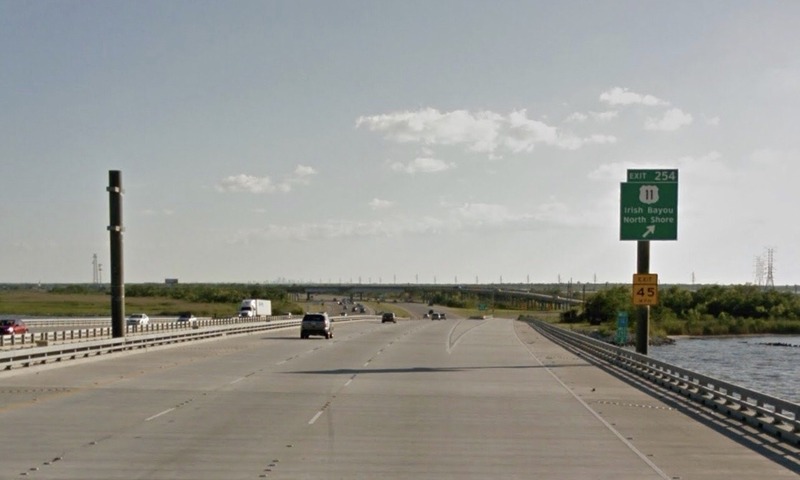 The FHWA needs to delete the verbiage from the MUTCD about sign fonts featuring lowercase characters with an x-height at least 75% the size of cap letter M-height. Last time I looked the MUTCD didn't feature that critical "at least" part in the verbiage. Too many people creating traffic signs here in Oklahoma totally misunderstand the specification. They scale the lowercase letters down to 75% of their original size. The end result is stuff like this example at Exit 1 of I-44: https://goo.gl/8Wtnhy. Great big capital letters and really tiny lowercase characters. Most of the new neighborhood street name signs in Lawton have the same problem. Here's another example taken from the Eastern Louisiana thread. 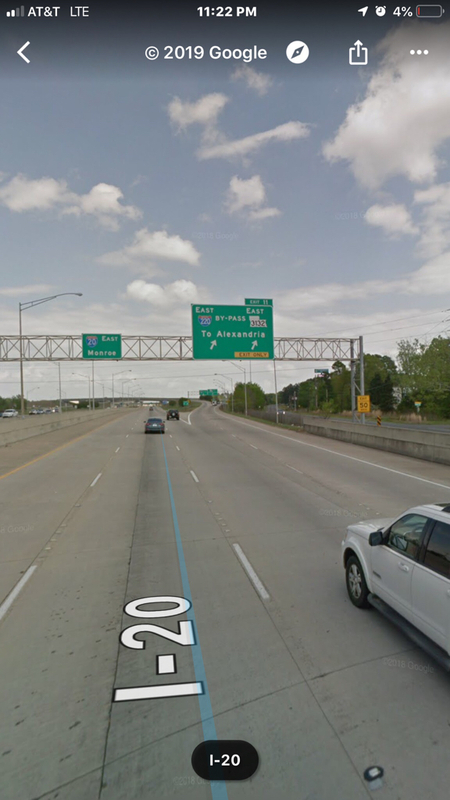 I'm going to guess that sign "solution" in at the I-10 & I-110 split in Baton Rouge might be temporary. Hopefully. That particular sign structure formerly had large overhead sign panels on it. Google Maps' street view imagery dated between 2011 and 2016 shows the previous sign. Maybe it was damaged in a storm or something. I wonder if it could be part of a bigger long-range plan to extend I-220 to the proposed I-69? Barksdale has always been opposed to having the highway come through the base itself. This really is just the building of a new "main gate". The current main gate is on US 71 south. The mainline of KCS's Alexandria Sub runs right in front of it. Across from it is the intersection of LA 3032 (Shreveport-Barksdale Hwy). Put a slow drag freight in front of this gate and you have a decent traffic snarl that takes place. Louisiana has lost 2 more outline state shield signs. 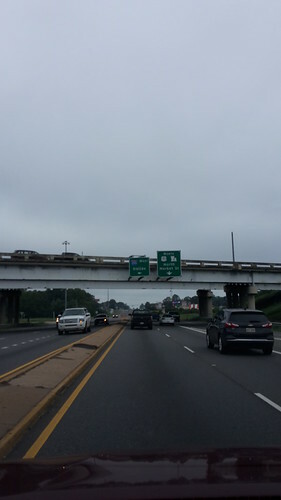 The 2 hanging over US 71/LA 1 at I-220 have been replaced with extruded panel signs & white LA 1 shields. I would like to take this moment to apologize for any broken hearts I may have caused making this report a few months ago....because I was dead wrong! The outline LA 1 shield signs on both overpasses are indeed still up. I just drove through there an hour ago and saw them with my own eyes. Again, I apologize for being so very wrong. And now only 3 remain. You know Iâ€™m a transportation & logistics geek, but the only number on that map that is out of whack & is an outlier, even for a major trade state like LA, is mileage of state roads. A state this size shouldnâ€™t have that much mileage. Need to transfer many back to the parishes. Is that the same Norby Chabert who got into a bar brawl with another legislator over disagreements about a bill a few months back? (that incident made it out here over Google and Bing newsfeeds!). Apparently he's the one who landed the most punches -- nice guy; a role model for all! Thanks for your constructive contributions. I doubt I can make it but if I could, I'd make sure to bring up two words: Interstate 14. As a possible place to start Louisiana's part of I-14? If both states are serious about I-14, then they should definitely stat planning early on for the Sabine River crossing. They definitely don't want to spend a lot of money replacing the bridge only to have to build an entirely separate bridge for I-14. It also presents an opportunity to plan a corridor between Jasper and Leesville that will hold the interstate (and perhaps some precursor of it as a realignment of TX-63 and LA-8). I was just looking at Google maps for a possible routing in that area. It looks like they will need to run the new route north of the old Sabine River bridge so as to avoid the Clear Creek WMA, continue arcing northward to avoid downtown Leesvile & Ft. Polk. There really won't be a great way to avoid that piece of Kisatchie NF on the way to Alexandria. Another outline shield BGS falls. Now only 2 remain, both on I-20 west bound for exit 21.